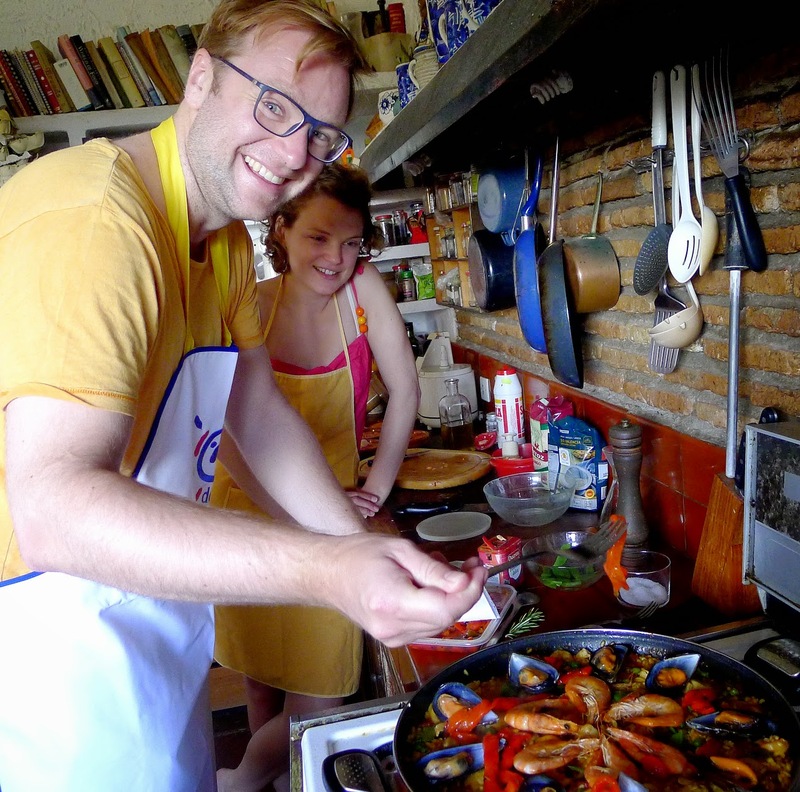 Come along for a paella cooking class. The paella cooking class starts at the local market. Lisa and Norbert, visitors from Munich, Germany, join me to buy all the ingredients we’ll need for today’s meal. Norbert already speaks good Spanish, as he studied a year in Mexico. As a developer of marketing programs for BMW autos, he visits Spain frequently. Lisa, a dentist, is studying Spanish. I give them a shopping list in Spanish so they can practice the vocabulary. Can you translate it? ”Artichokes” is followed by question marks, because I wasn’t sure if they would be available. And they weren’t. 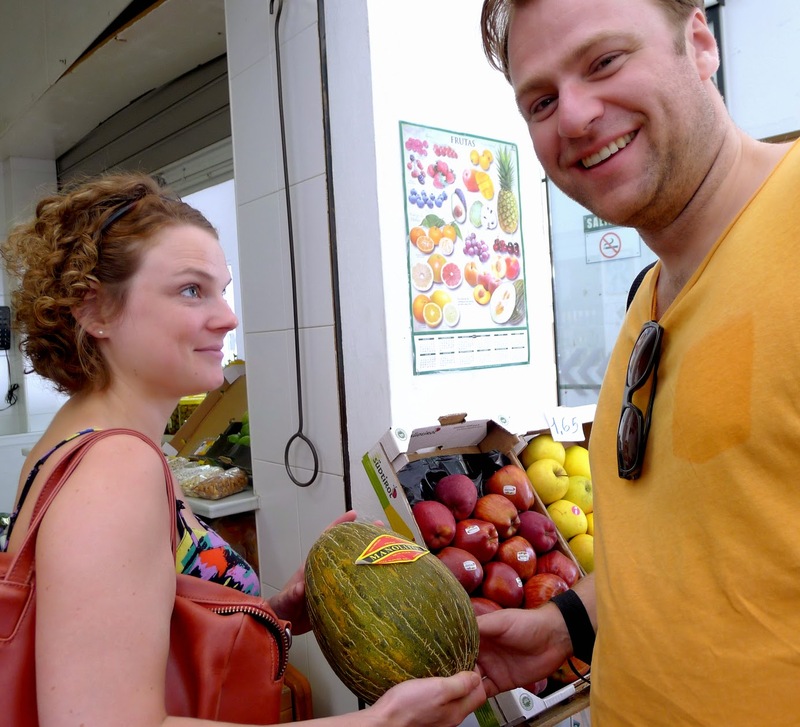 We didn’t need to go to the supermercado, as both rice and olive oil were available at the market too. The toasted almonds are to serve as nibbles while we cook. The ham is the topping for the salmorejo to serve as a starter; “toad skin” melon, an exceptionally sweet variety, will be our dessert. 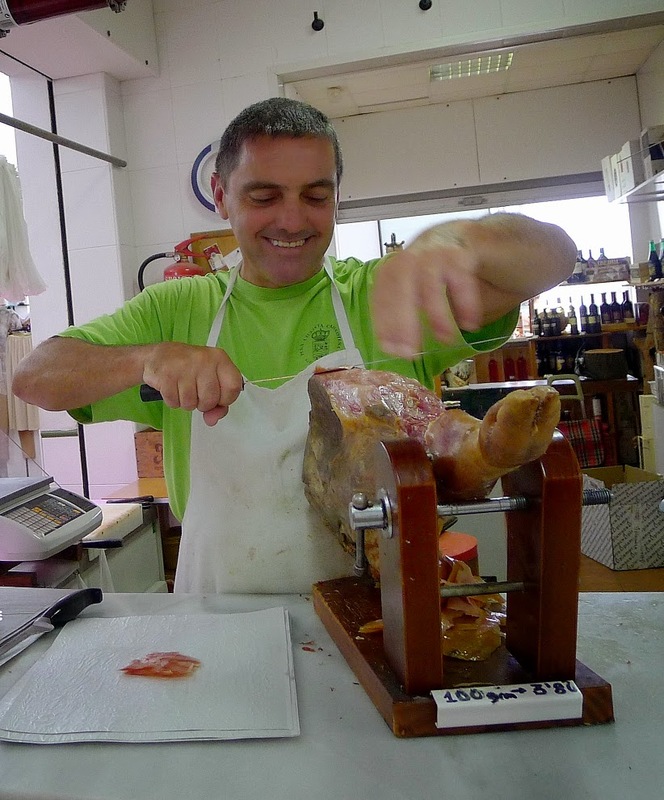 Francisco offers us a sample of serrano ham. A fish vendor shows how to clean fresh squid. Café con leche at a plaza café. After shopping, we stop at a café in the plaza for segundo desayuno, second breakfast—café con leche (with glasses of ice cubes to cool it down) and pitufo catalan, a toasted bun rubbed with tomato, drizzled with olive oil and topped with ham. I tell Lisa and Norbert that paella is never, ever served at night. It’s an afternoon meal, especially for Sundays and holidays. However, we decide that it’s too hot at midafternoon to really enjoy the meal. The plan: start cooking (in my air-conditioned kitchen) about 6:30, to eat at sundown on the terrace. While Norbert and Lisa cool off by the pool during the afternoon, I do some prepping. I peel the shrimp and use the heads and shells to make a stock that will add flavor to the paella rice. I’ve also scrubbed the mussels and steamed them open. They’re refrigerated until time to garnish the finished paella. We’re using a 12-inch paella pan with no-stick surface. No, this is not traditional. I show them a “real” paella pan, of rolled steel. It’s great for cooking outside on a wood fire, but needs care to prevent rusting. It’s hard to manage such a large pan on the stove top. What to use back in Germany? they ask. A large skillet or a flat-bottom wok are possible substitutes. “I’m not so good at cutting,” says Norbert, faced with chopping up peppers and tomatoes for the sofrito, the starting point of paella. Lisa takes over on the chopping detail. 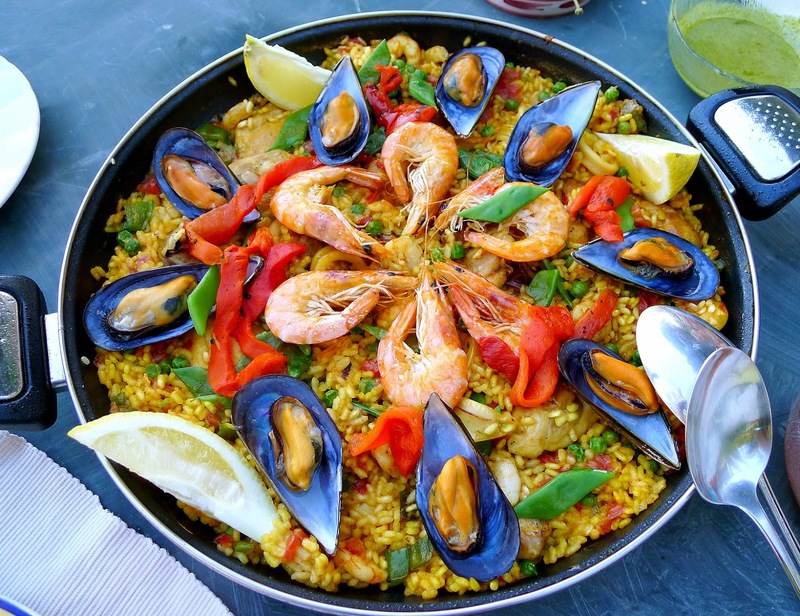 A good paella starts with a sofrito, the slow sauteeing of chicken, shellfish, peppers, garlic and tomatoes. Good olive oil is the essential in this process. First we sauté whole shrimp in the oil and remove them. The shrimp flavors the oil and will later serve to garnish the rice. Next, the chicken pieces go in the pan to brown, then the chopped green peppers and garlic. Time to open a bottle of chilled vino rosado (rosé). Crush the saffron threads in a mortar. Meanwhile, Norbert crushes the saffron threads in a mortar and puts them in a cup of hot water to infuse. Saffron gives inimitable color and flavor to the paella. I demonstrate how to use kitchen scissors to cut the squid into rings. Into the pan they go. Then the chopped tomatoes. After this mixture “fries” for several minutes, we stir in the rice. The shrimp stock is simmering nearby. We’ll need about double the volume of liquid to rice, so 4 cups of stock for 2 cups rice. (I gave Norbert and Lisa the paella recipe in metric measures.) I like to save out a cup of the liquid to add towards the end of cooking. We add the saffron water, then taste the liquid to see if it needs salt. “More salt,” says Lisa. Tasting is important-- if the stock is really salty, no more is needed. We put in par-boiled green beans, frozen peas and all of the small peeled shrimp. Won’t they be overcooked? That’s not the point. Think of them as flavoring, adding to the total flavor of the rice. We stir in the saffron water. Look! the rice is turning golden. Unlike risotto, I tell my paella trainees, this rice gets stirred hardly at all, once at the beginning to distribute the ingredients, maybe again part way through cooking. 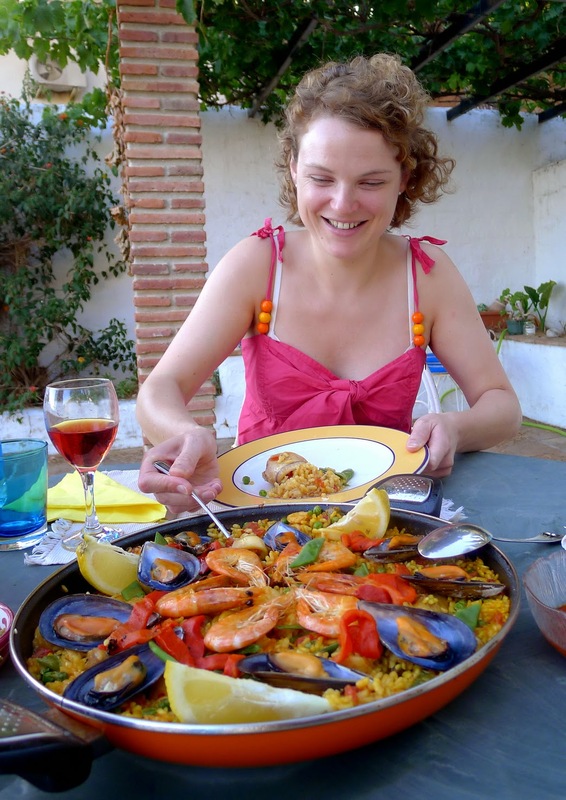 Top the paella with mussels and shrimp. Norbert garnishes with strips of red pepper. We stir the remaining hot stock into the paella and reduce the heat to low. Ten minutes more to cook, until the rice is just barely tender and all of the liquid absorbed. Lisa places the cooked mussels and shrimp around the top and Norbert gives the paella a final touch with strips of roasted red pepper. Covered with foil, it sets for 10 minutes. Add the pieces of chicken to the oil and saute on a medium-high heat until they are browned on both sides. Add the squid and fry. Add the peppers and garlic and continue sauteing. Add the artichokes. (If you cut them immediately before adding to the pan, they do not need to be rubbed with lemon.) Next add the tomatoes and continue frying. Add the reserved mussel or clam liquid to the stock. Bring the stock to a boil in a separate pan. Add the rice to the paella pan. Stir it in to combine all the ingredients. Stir in all but 1 cup of the hot stock. Add the saffron water, pepper and salt to taste (depending on the saltiness of the stock). Let everything cook on a medium-high heat for 10 minutes, then add remaining hot stock, turn the heat down to low and continue to cook until rice is just tender, about 10 minutes more. 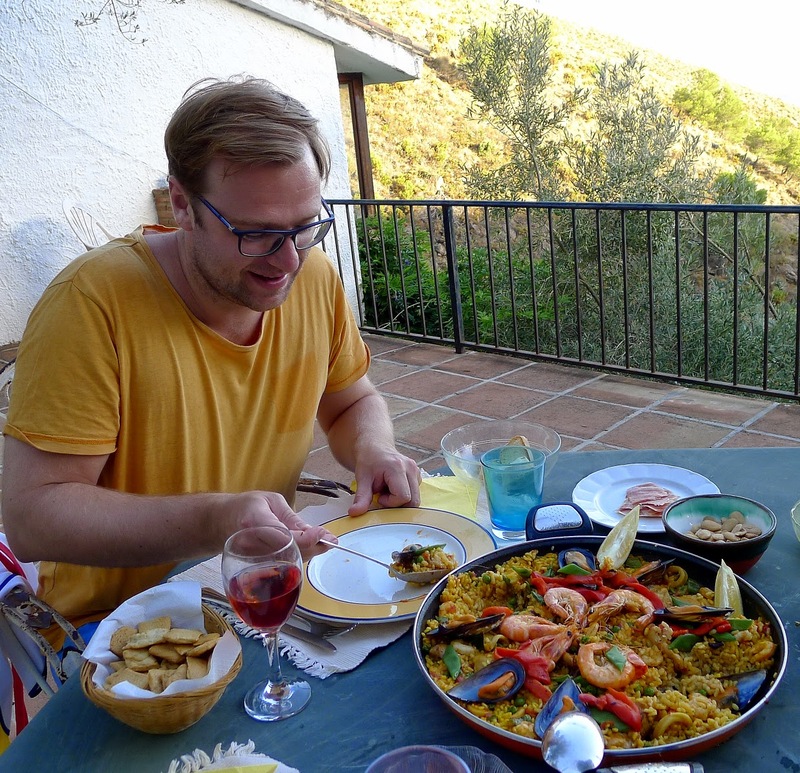 Want to learn to make paella? 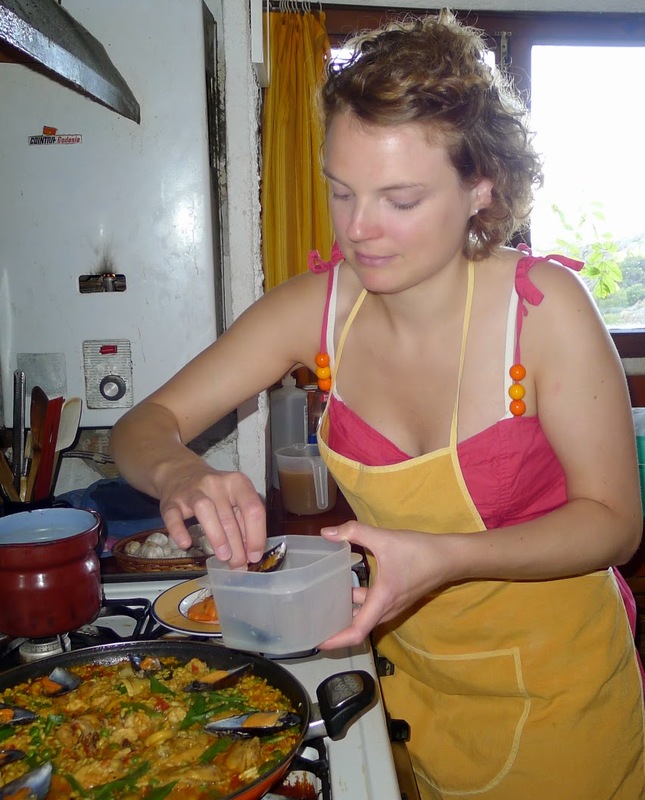 Follow this link to read more about cooking classes in My Kitchen in Spain. Vegetables grilling on a plancha. Summer means grilling season. I know that. But rarely do I fire up a charcoal or wood-fired grill for only one or two persons. Instead, I do my grilling on a plancha in the comfort of the kitchen. Plancha means a metal plate. It’s also the word for “iron,” the sort you iron your clothes with. Nowadays, irons are electric, but I once lived in an old mill house in the country with no electricity. We heated heavy planchas on a gas fire to iron our clothes. I had a pair of them—one to heat while the other was in use. But, back to grilling on a plancha. In a tapa bar, a plancha is the same sort of griddle you might find in a fast-food joint for grilling hamburgers. 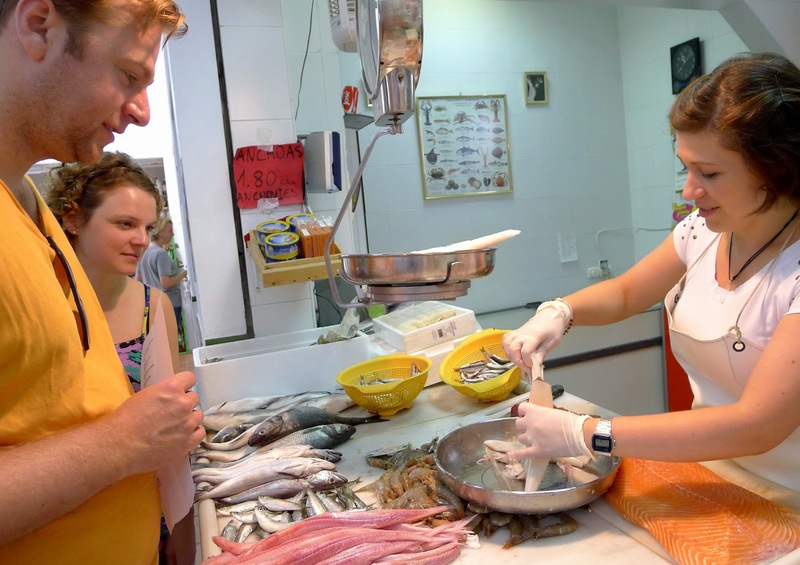 Instead of burgers, the grill meister is cooking tiny squid; whole, unpeeled prawns; slabs of swordfish steak; pork cutlets, and small steaks, basting them with aliño, a mixture of olive oil, garlic, parsley and lemon. I am amazed at the skill, knowing exactly when to turn each piece of food, when to remove it from the grill. A plancha is a great tool for home cooking. I prefer a heavy, cast-iron grill pan that heats evenly. 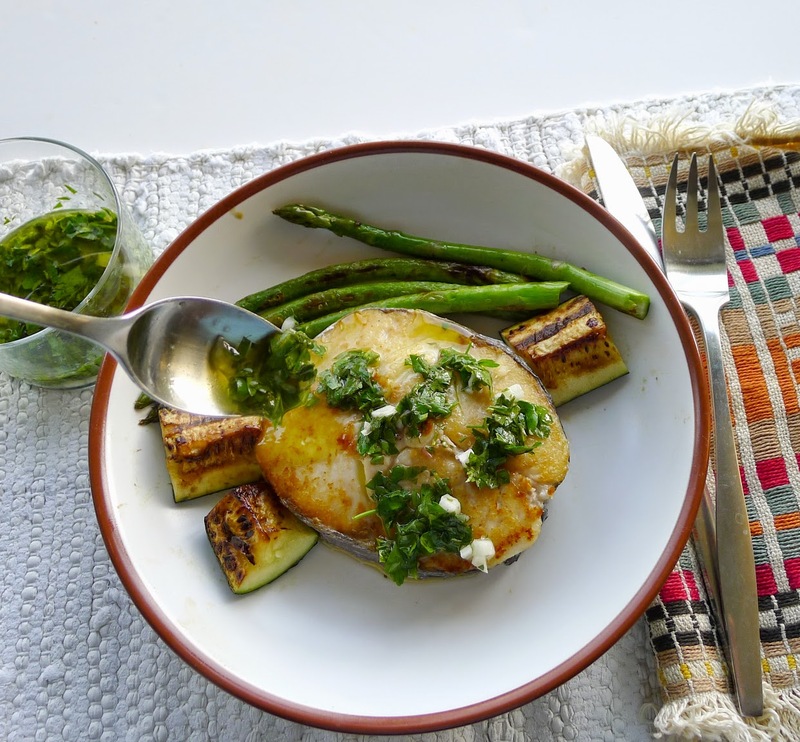 Especially useful is a reversible one—ridged grill pan on one side, great for steaks, and flat griddle on the other, perfect for fish and shellfish. The plancha sets directly over a gas burner. 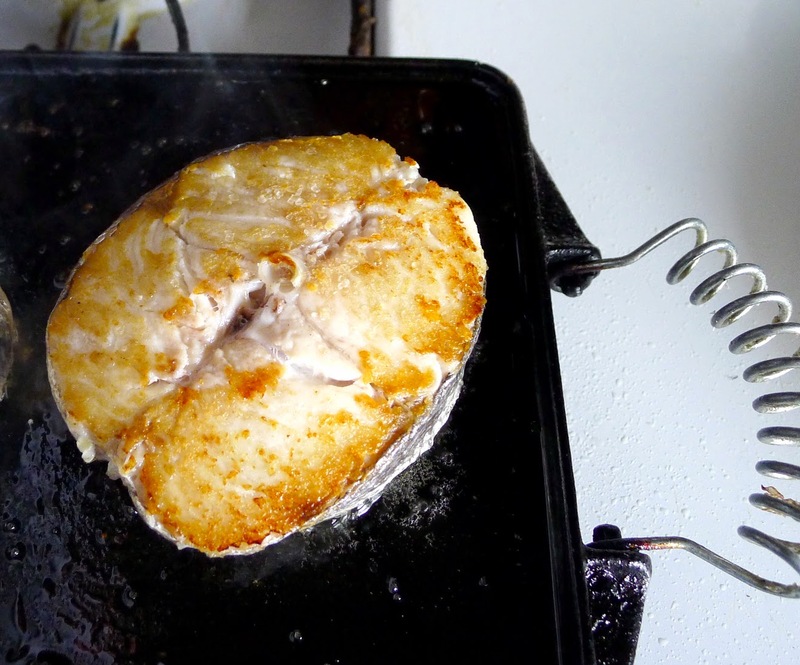 Hake steak on a flat plancha. 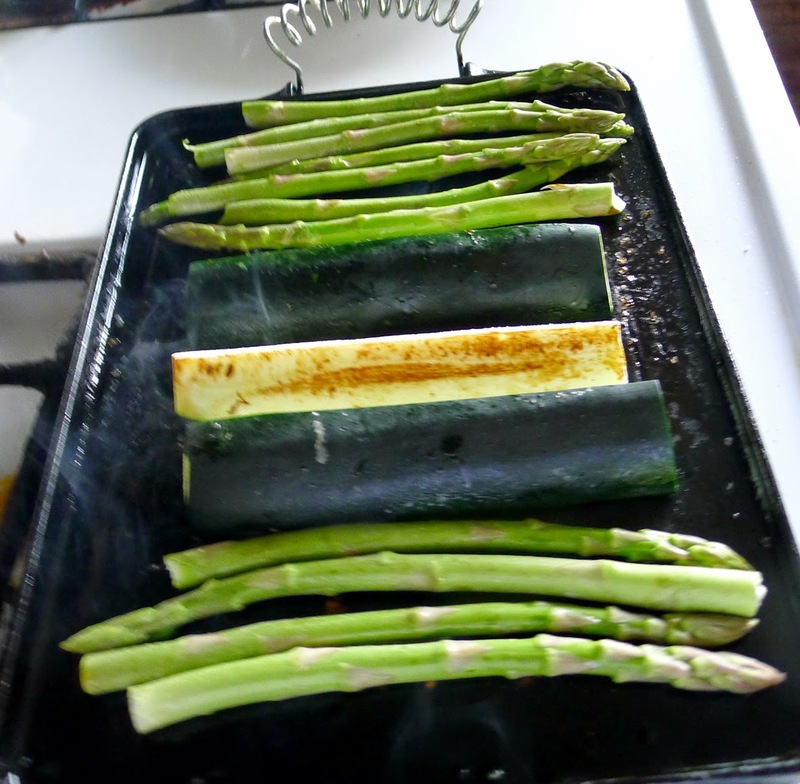 How to grill on a plancha: Place the plancha over high heat until very hot, about 4 minutes. Then brush the grill with olive oil and sprinkle with coarse salt (same procedure whether using a flat or ridged grill pan). Place food to be grilled on the plancha. Keep the heat on high to get a good sear on the food. Don’t move it around. Then turn it. Timing is the tricky bit, just as it is with grilling on charcoal. It takes some practice to know when to turn the food, when to take it off the grill. 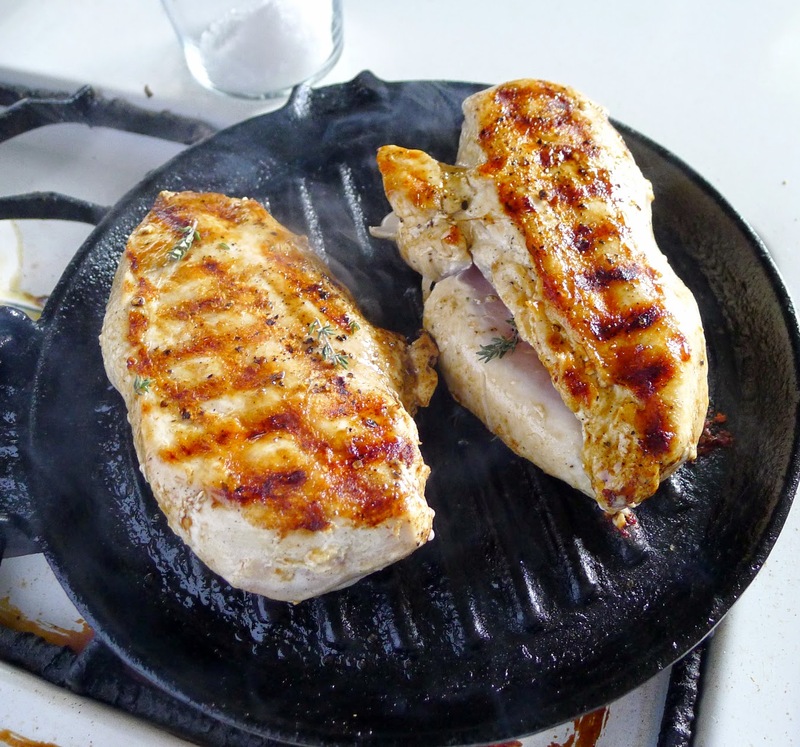 Chicken breasts on a ridged grill pan. If you don’t have a plancha, substitute a large cast iron skillet. An extractor fan helps to draw out the smoke from grilling, but you might set off the smoke alarm in any case. By the way, any of the foods cooked on a plancha can also be cooked a la parilla, on a charcoal or wood-fired grill. What I most like about plancha cooking is that it doesn’t need a whole lot of pre-planning—no marinades, rubs, brines required. But, plancha-grilled foods really do need a sensational sauce. Romesco sauce with grilled shrimp. 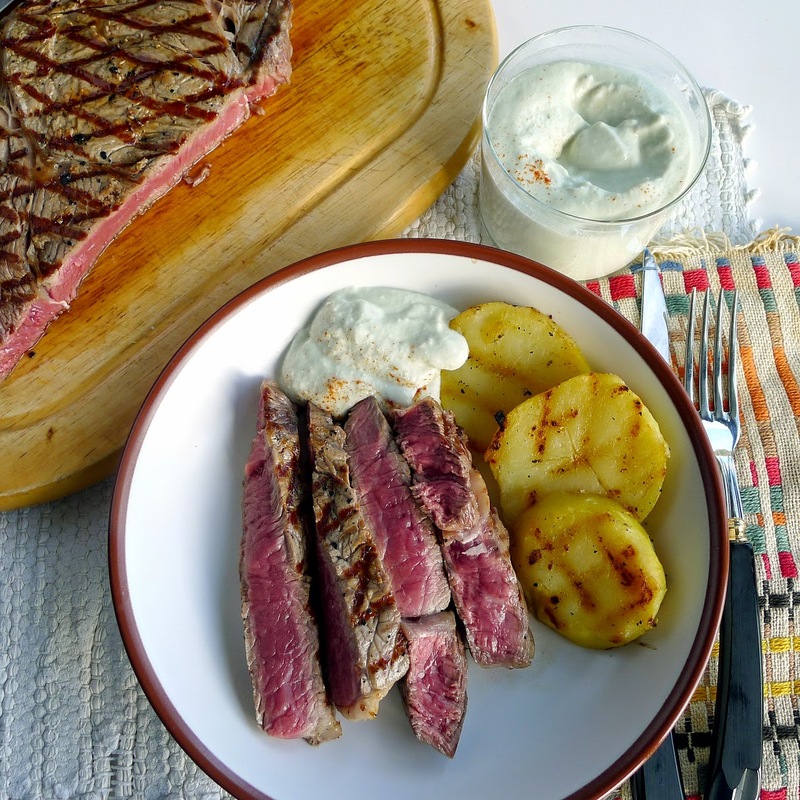 Alioli (garlic-olive oil mayonnaise) with griddled lamb chops or rabbit. Piquillo pepper sauce with fish. Here’s a bunch more. This simple sauce is spooned over grilled foods immediately before serving. Use it with griddled baby cuttlefish, grilled chicken breast or any fish fillet. The sauce can also be used as a marinade or basting sauce. Keep it handy when you´re grilling meat, poultry and fish. Combine all the ingredients in a small bowl and stir to mix. Use at room temperature. Sauce may be kept, covered and refrigerated, for up to one week. Grilled hake and vegetables, drizzled with aliño. 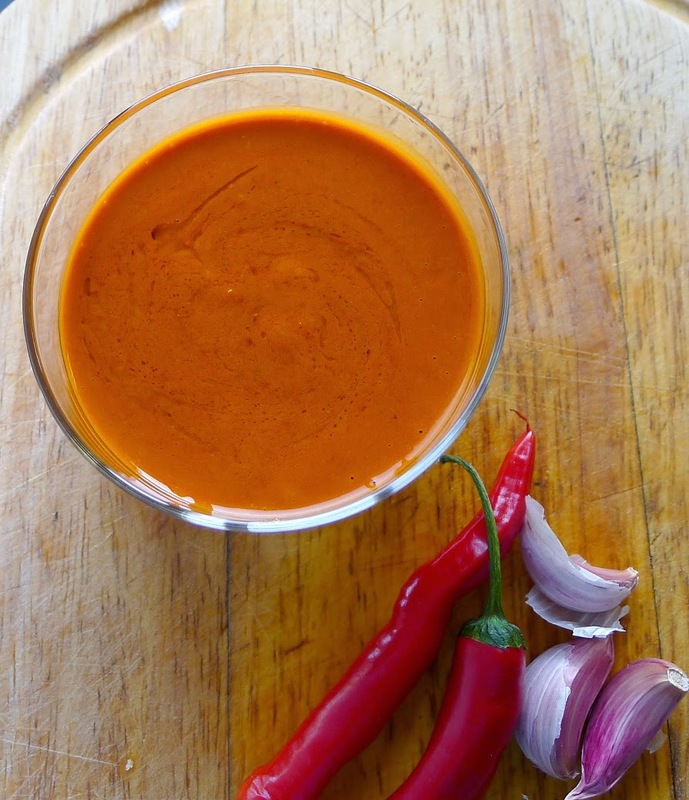 This spicy Canary Islands sauce is sensational with grilled fish, lamb, or vegetables. Cilantro, garlic, chiles for mojo verde. Place all ingredients in a blender container and blend until smooth. Sauce keeps, covered and refrigerated, one week. 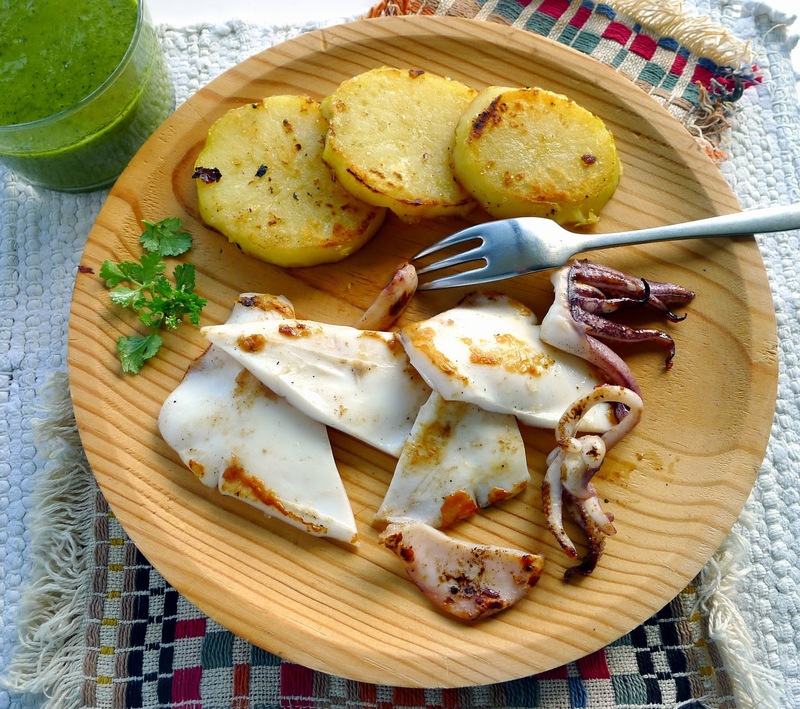 Squid and sliced potatoes are grilled on a plancha, served with spicy mojo verde. The squid was cut open lengthwise, edges snipped to prevent their curling and grilled whole, then cut in pieces to serve. The potatoes were partially cooked whole, then sliced and brushed with olive oil before placing on the grill pan. 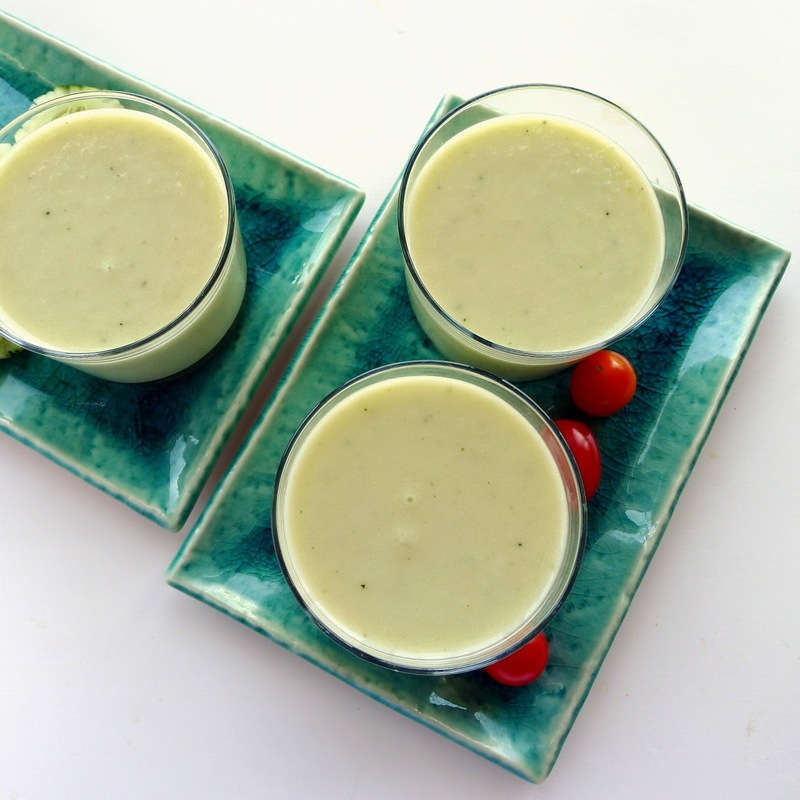 Serve this as a dipping sauce for chips, with grilled chicken or meat. Place all of the ingredients in a blender and blend until smooth. If desired, thin with a little water. Sauce keeps one week, refrigerated. 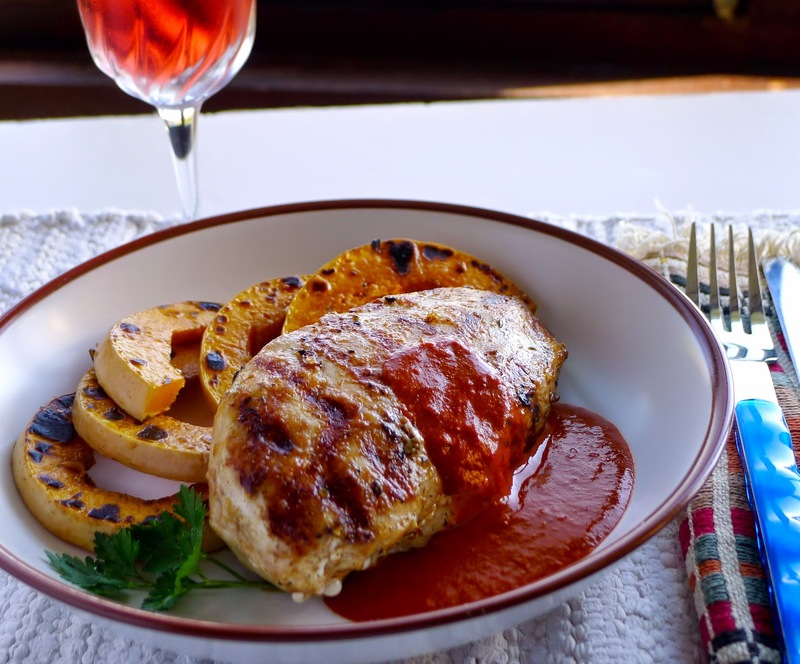 Grilled chicken and butternut squash with mojo picón. 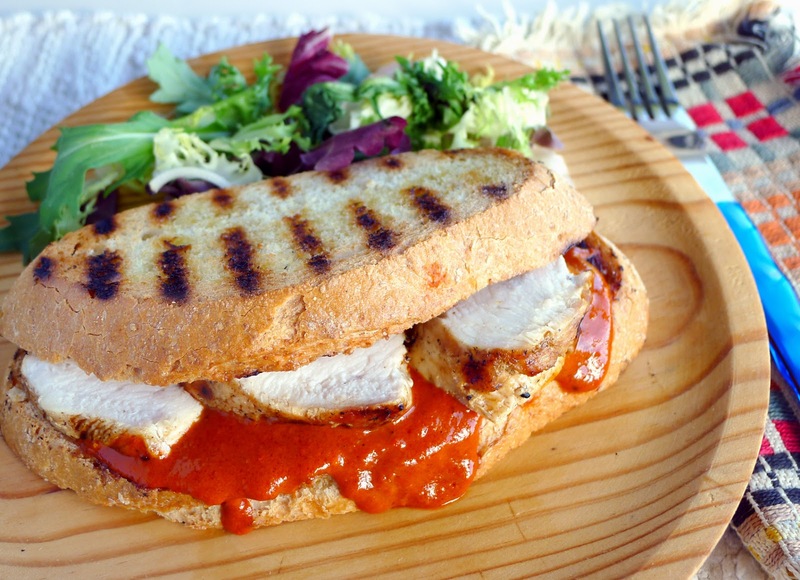 Sliced chicken on grilled bread with spicy red chile sauce. Cabrales is a distinctive blue cheese from Asturias—sharp, but remarkably creamy in consistency. 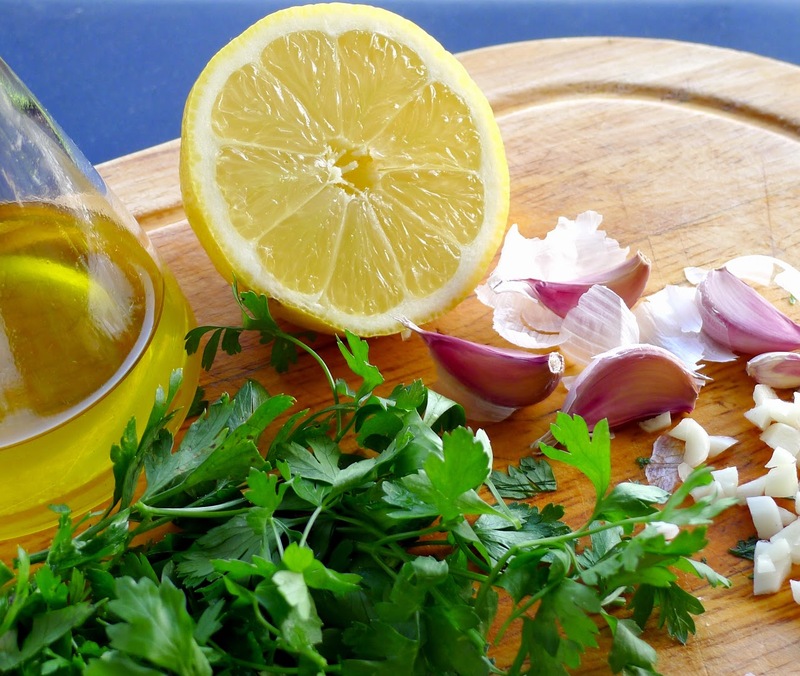 It makes a delightful dressing or dip when thinned with wine or, in the Asturian style, dry cider. It's a classic served with grilled entrecote steaks. But, you know what? I didn't really like the blue cheese sauce with the steak. It was delicious, however, with the potatoes and as a dip with endive leaves. Place the cheese in a blender with onions, wine and cumin seed. Blend until smooth. Serve immediately or keep, covered and refrigerated, up to 3 days. Ridged grill pan gives a good sear to steak, sliced potatoes. 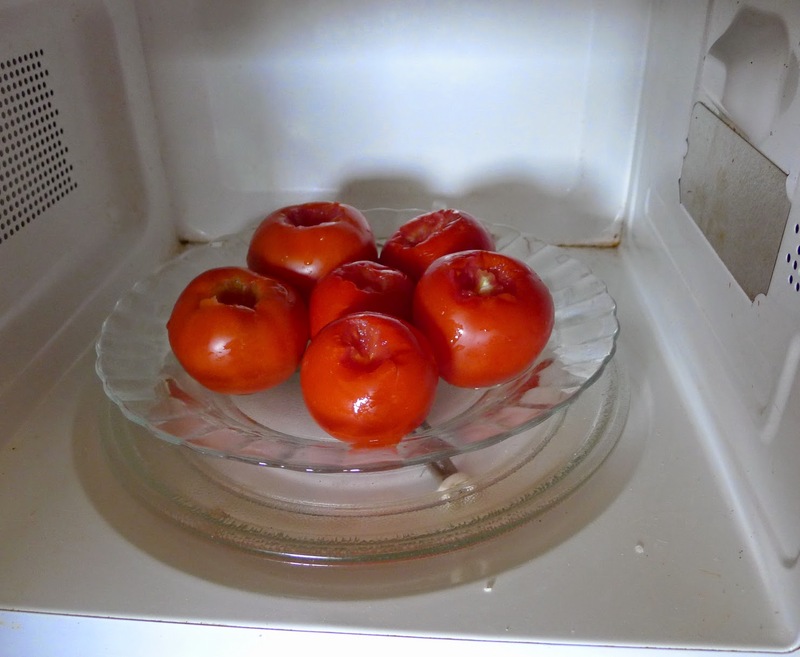 Microwave--quick way to prep tomatoes for peeling. From the first of June until the first of September, I don’t turn on the oven. It’s just too damn hot. In keeping a cool kitchen, I use the good old microwave to fill in for the oven. My ancient gas stove/oven (an American-made Magic Chef, purchased 30 years ago, second-hand, at the American naval base at Rota) runs on bottled butane gas. I used to hump gas tanks into the trunk of my car in the village and bump them down the steps to the kitchen. Now the delivery guys bring them to the door. The microwave cuts down on my gas consumption, another plus. The microwave was a late addition to my kitchen. I got my first computer in 1987; an internet connection in 1995, but I did not get my first microwave until 1996. By then my kids were grown and not living at home. I began cooking differently. No more big roasts in the oven, nor huge pots of slow-simmering soups and stews. Microwaved meals are perfect for one or two people. I’m not ashamed to say that I use the microwave a lot, especially in summer. VEGETABLES. The microwave really is great for cooking vegetables. Tomatoes. I use the microwave to quickly scald tomatoes for peeling. Sure beats heating a pot of water. Cut out the stems, arrange tomatoes on a plate, microwave on HIGH for 2 minutes. Turn the tomatoes over, microwave on HIGH for 2 minutes longer. Allow to cool. Slip off skins. I package them in bags and freeze for winter soups, stews and sauces. Tender eggplant, ready to puree. Eggplant. 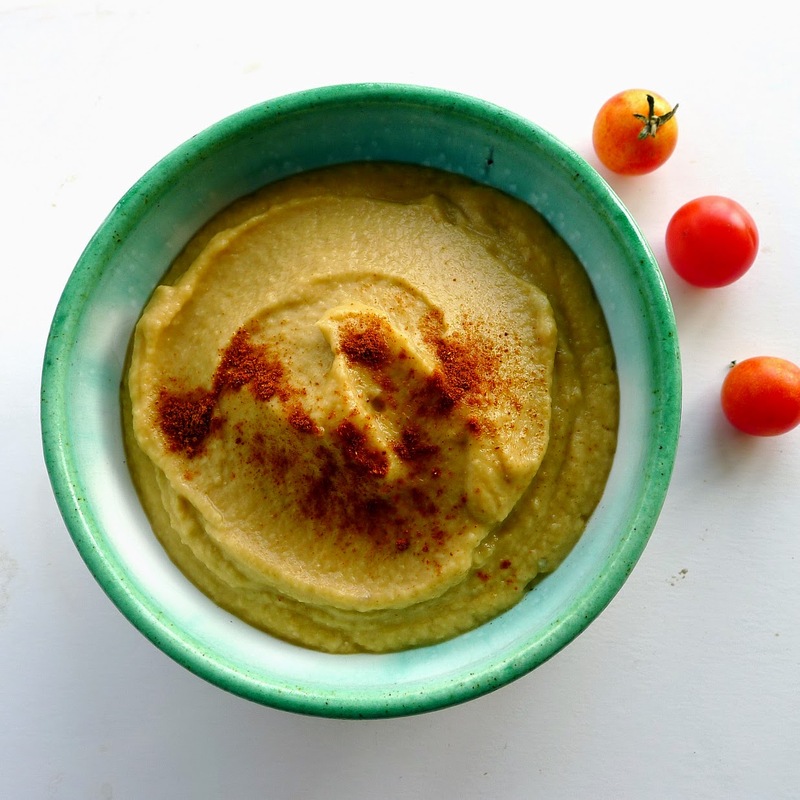 Make a quick puree, for terrines, patties or baba ghanoush. 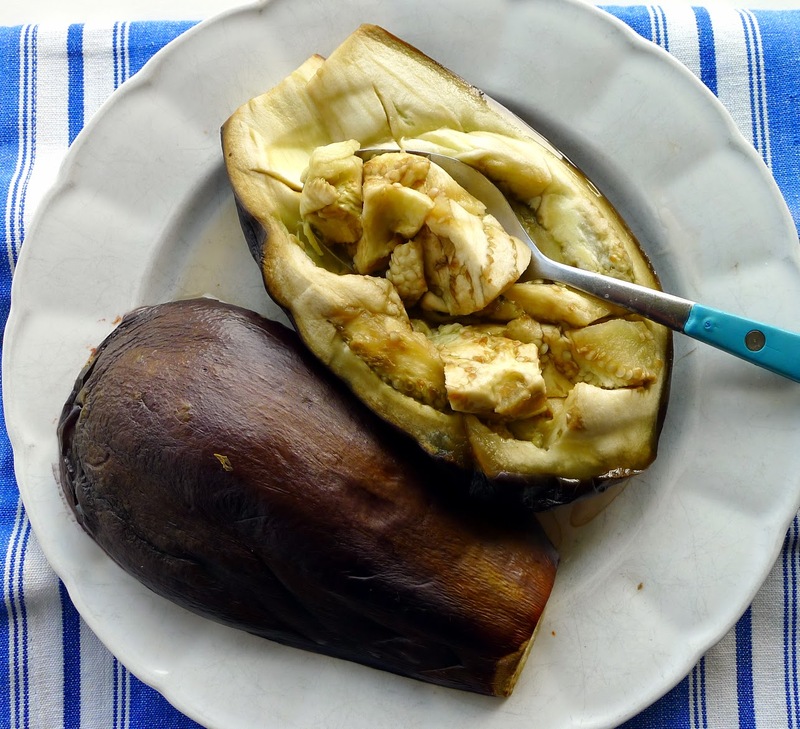 Cut medium eggplant in half lengthwise. Score the flesh with a knife. Place the halves on a plate, flesh-side down. Cover with vented microwave-safe lid. Microwave on HIGH 4 minutes. Reposition the halves, but leave them flesh-side down. Microwave on HIGH 4 minutes longer. Allow to stand 10 minutes. Scoop and scrape the flesh out of the skins into blender container. If making baba ghanoush, use ½ teaspoon of smoked pimentón (paprika) along with lemon juice, garlic, olive oil and salt. The smoked pimentón adds a char-roasted flavor. Peppers. 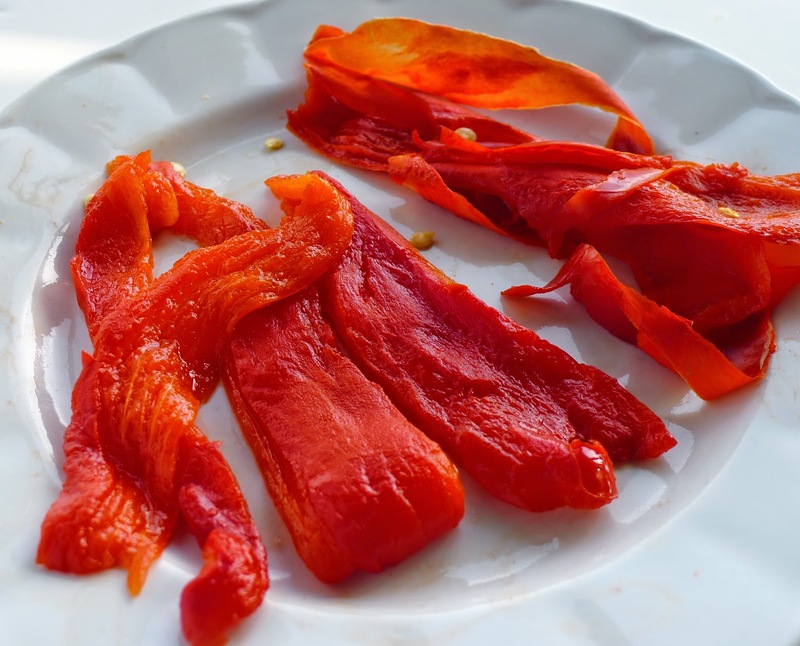 Use the microwave to “roast” red bell peppers for salads. 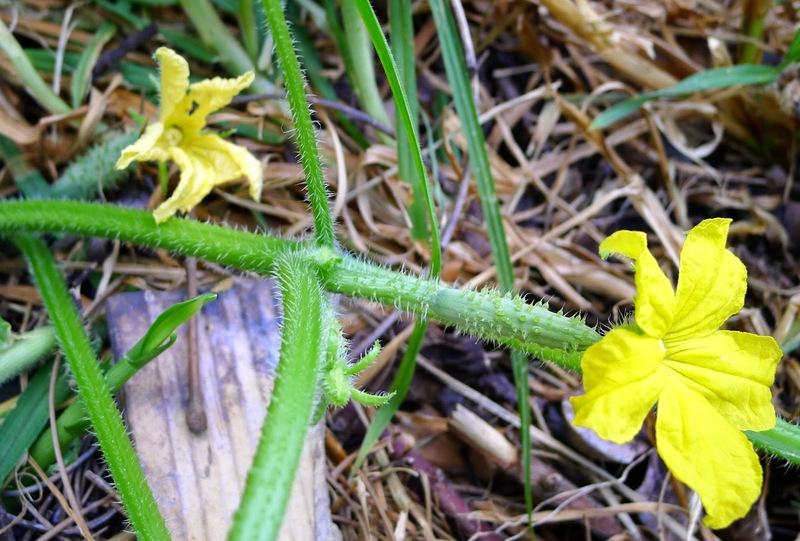 Cut them in half, remove stems and seeds and place skin-side up on a plate. Microwave on HIGH for 3 minutes. Allow to stand until cool, then peel off skins. Easy side dish--zucchini and tomatoes with basil. Important: Do not salt the vegetables before cooking! 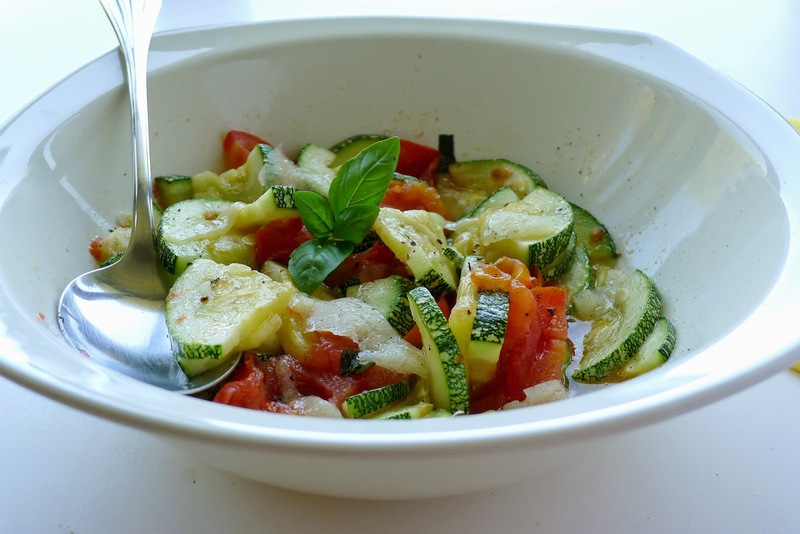 Place the zucchini, tomato, oil and garlic in a microwave-safe bowl. Add a few shredded basil leaves. Microwave on HIGH for 2 minutes. Remove and stir the vegetables. Microwave on HIGH for 2 minutes more. Allow to stand 5 minutes. Stir the vegetables. Sprinkle with salt and pepper. Add fresh basil to garnish. Serve hot, room temperature or cold. Mussels. Put 6-10 mussels in a microwave-safe bowl. Add 3 tablespoons of water and microwave on HIGH for 2 minutes. Remove any mussels that have opened. Microwave 1 minute more. Discard any mussels which have not opened. 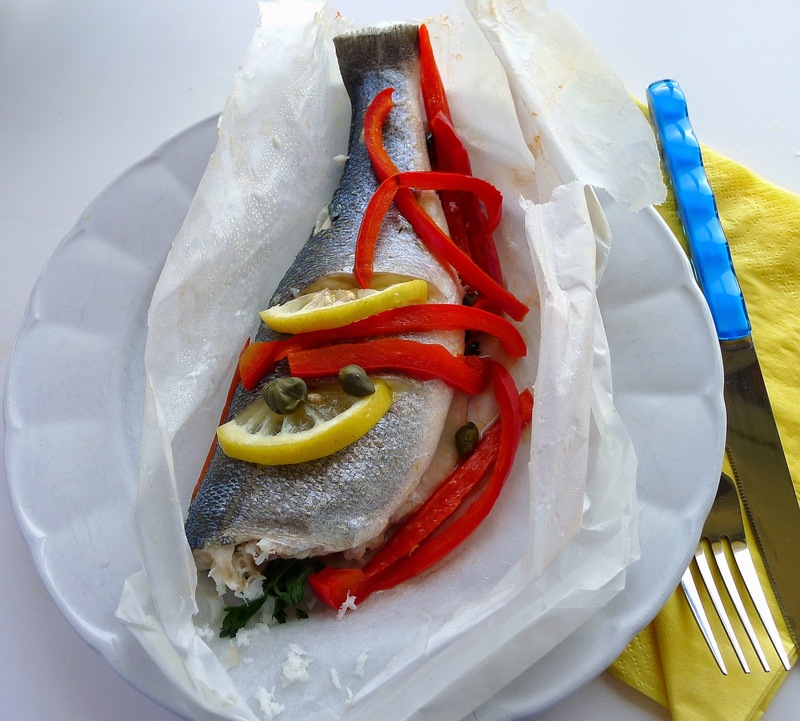 Sea bass, peppers and capers en papillote (parchment). Salt the cavity of the fish very lightly and place a few sprigs of parsley in it. Cut gashes in the skin on both sides of the fish. Insert half lemon slices on one side. Fold over edges to seal. 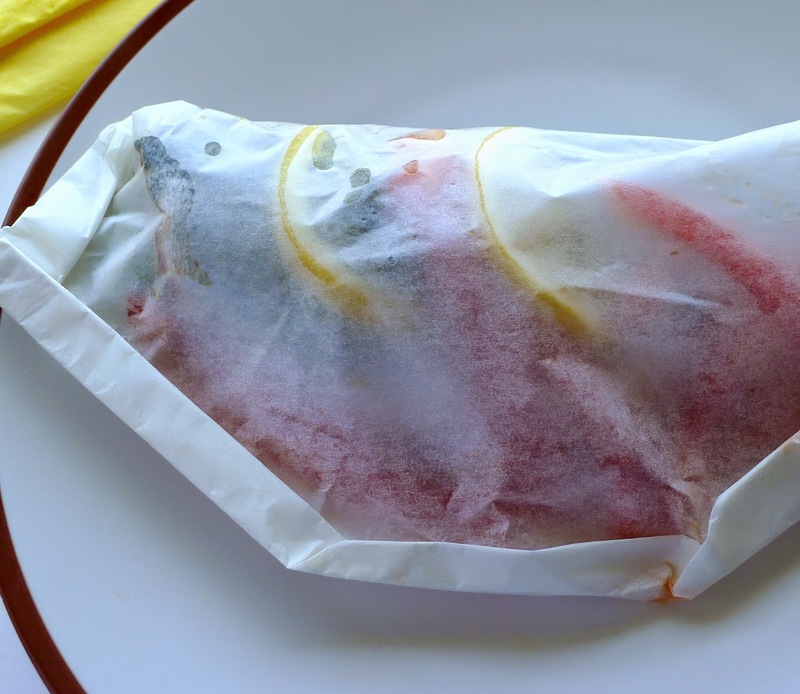 Fold a square of parchment paper in half. Place a fish on it at the fold. Arrange strips of red pepper on top. Sprinkle with a few capers. Drizzle with oil. Fold the other half of paper over the fish. With scissors, snip off the top corners of the paper on a diagonal. Starting at the lower corner, fold the edges together. Continue around the perimeter, sealing in the fish. Place the packet on a plate (you can cook two at a time). Microwave on HIGH for 4 minutes. Serve fish in the parchment packets or snip the packets open with scissors and serve the fish, peppers and all the juices onto plates. 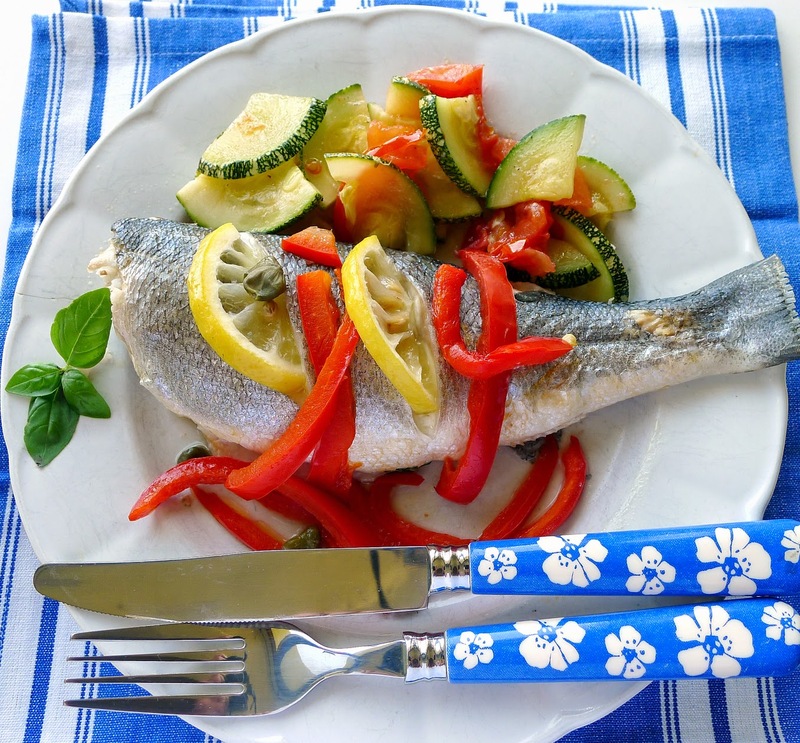 Both fish and vegetable side dish are cooked in the microwave. This makes great cold cuts, so much better than buying packaged turkey “lunch meat.” I used to prepare it in a plastic zip-bag. However, some experts say that you shouldn’t use plastic bags or wrap in microwave cookery if they are touching the food. The recipe works fine in a bowl with a vented lid. Important: Do not add salt before cooking. I know, that sounds contrary to your best instincts, to keep the meat juicy by brining. But not for microwave cooking. Pierce plastic wrap to make steam vents. 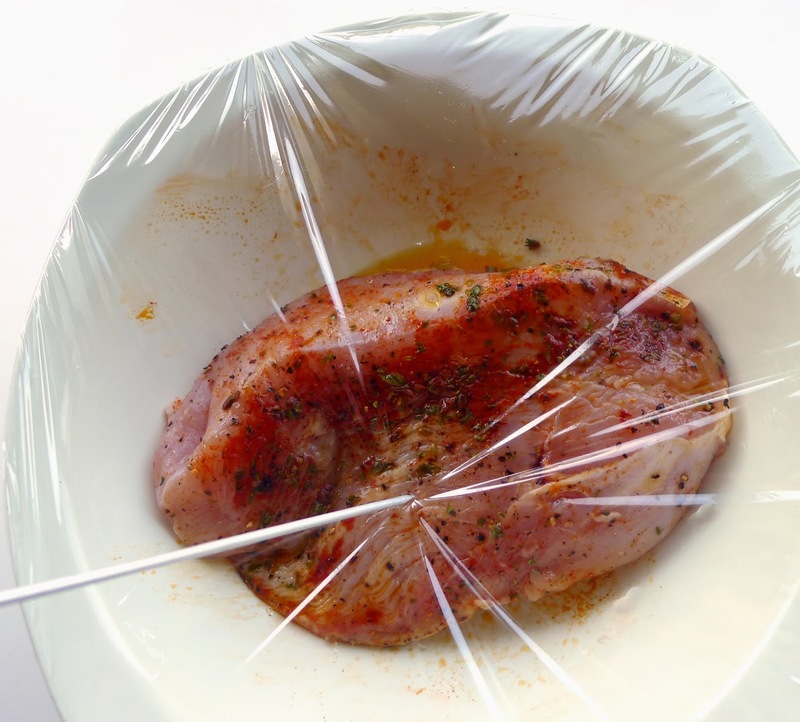 Place the turkey breast in a microwave-safe bowl. Sprinkle with half the pepper, oil, vinegar, oregano, thyme and pimentón. Turn the turkey over and add the other half. Cover and refrigerate 6 to 8 hours. Allow to cool completely. Slice thinly to serve. 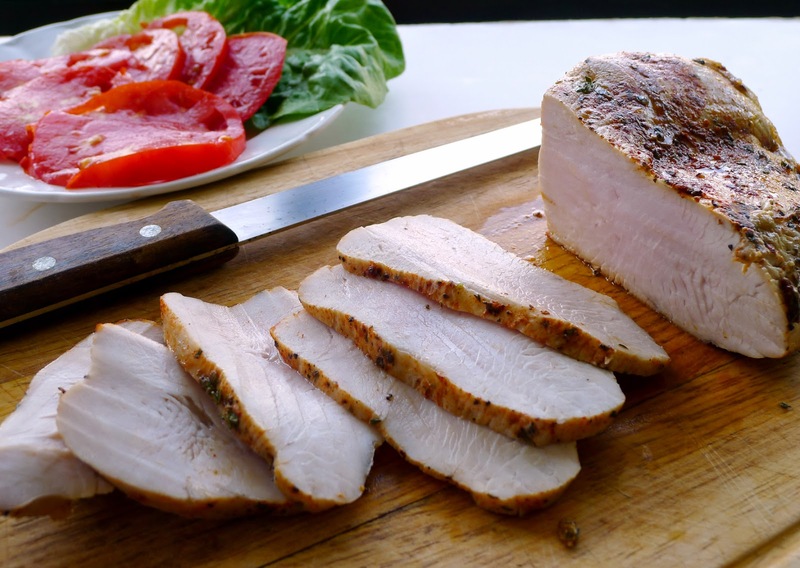 Marinated turkey breast cooks in less than 10 minutes. CAKE. 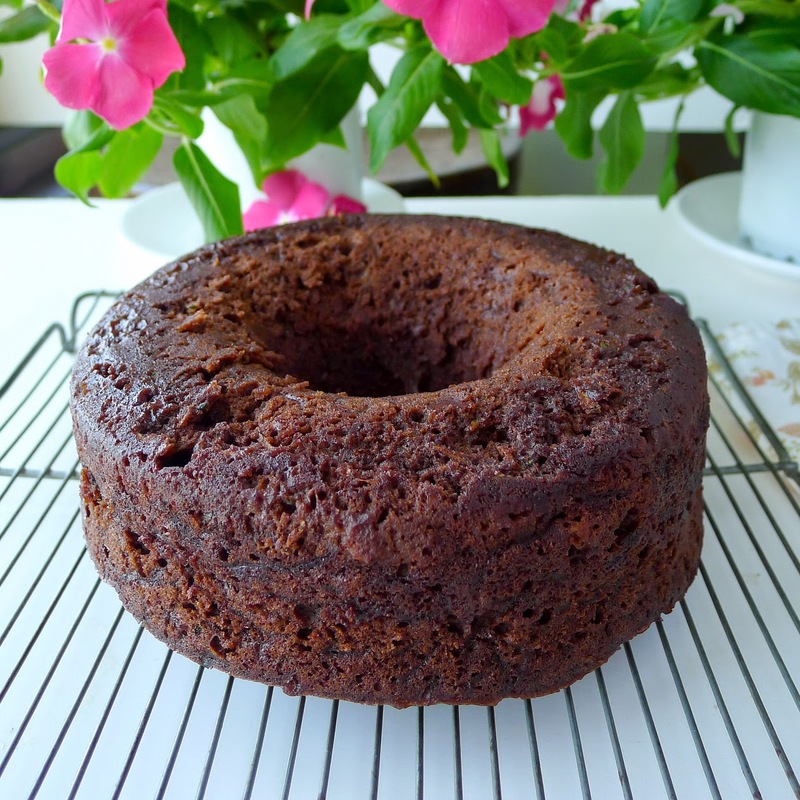 Microwave cakes don’t have the light crumb of oven-baked cakes. But, they are moist, sweet and fast! 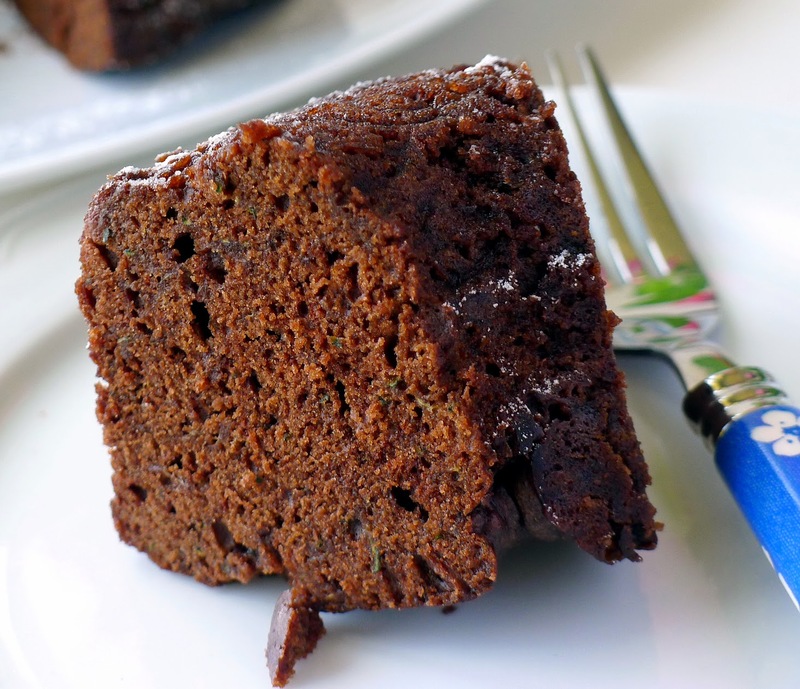 Zucchini-chocolate cake, baked in a microwave, is moist and sweet. This was inspired by the recipe for Chocolate and Zucchini Cake in the book, Chocolate and Zucchini by Clotilde Dusoulier. 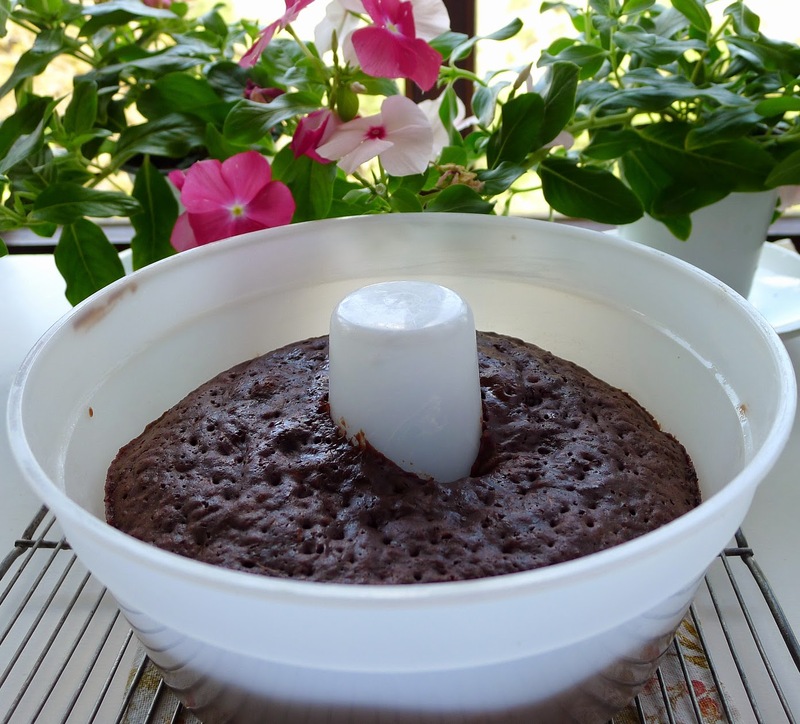 For this microwave cake, you need a 6-cup microwave-safe ring mold. Bake in a ring mold. In a bowl, combine the flour, cornstarch, cocoa, baking soda, baking powder, salt and cinnamon. Use a little of the oil to lightly coat the ring mold. In a mixing bowl, beat together the oil and two kinds of sugar.until smooth. Beat in the eggs and vanilla. Beat in the dry ingredients, little by little. Batter will be very thick. Stir in the zucchini. Pour into the ring mold. Cover the top with a paper towel. Microwave on HIGH for 3 minutes. Reposition the pan. Microwave on HIGH for 2 minutes more. Allow to stand for 10 minutes. Remove from mold and cool on a rack. Place on a serving plate. Sprinkle with powdered sugar or dribble with chocolate glaze. Microwave cake seems to cry out for a dollop of vanilla ice cream! 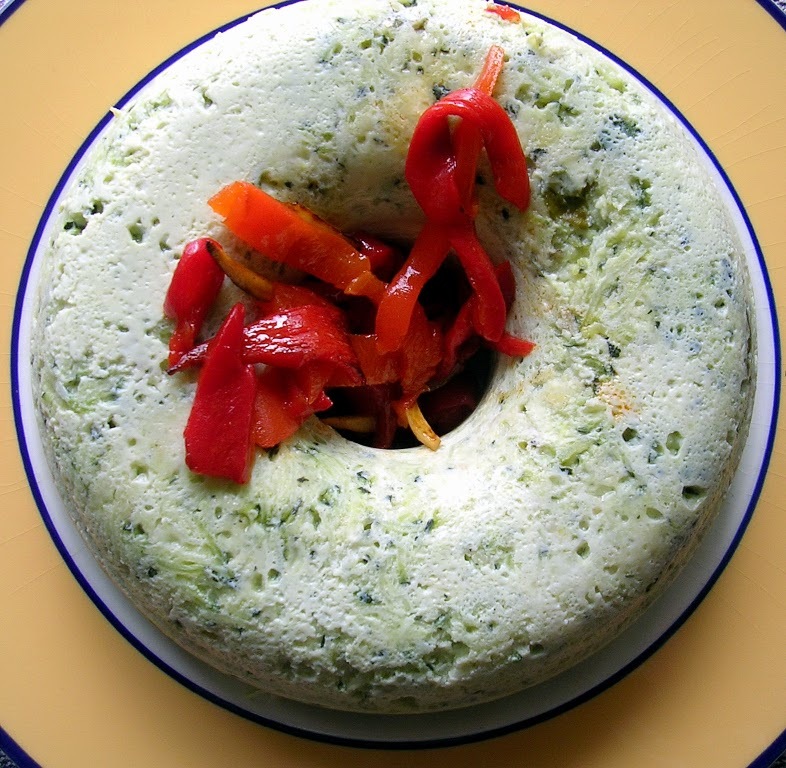 Use the same ring mold to make this zucchini timbale in the microwave. That recipe is here. Got more ideas for summer cooking in the microwave? I'm open to new ideas. Leave me a comment. 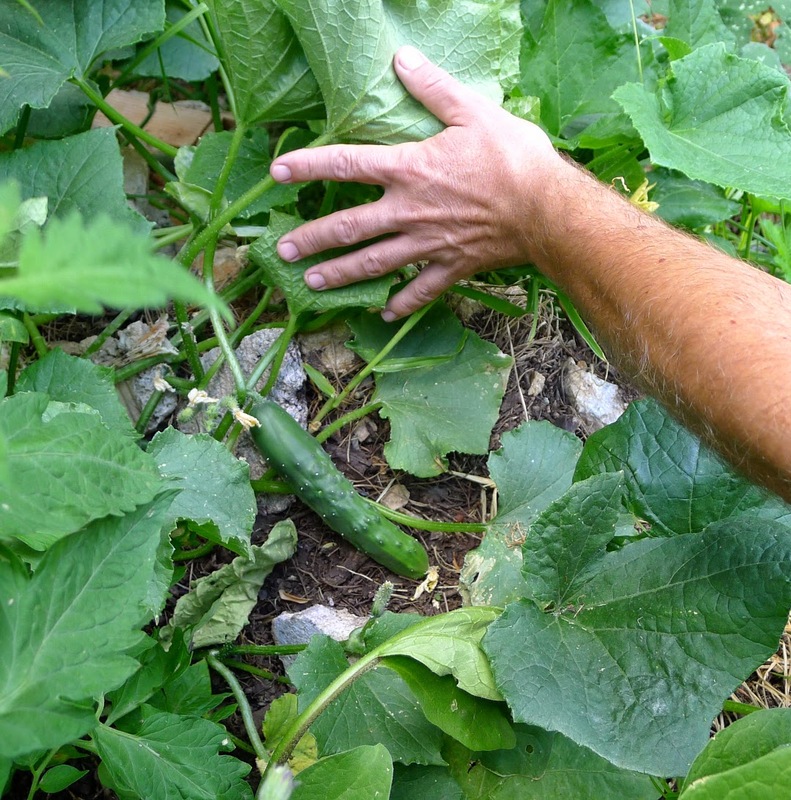 We’re rolling in cucumbers! A few vines in the garden are starting to produce lots and yesterday we got a batch more from a friend’s garden. We like them simply sliced and marinated with salt, vinegar and a pinch of sugar. 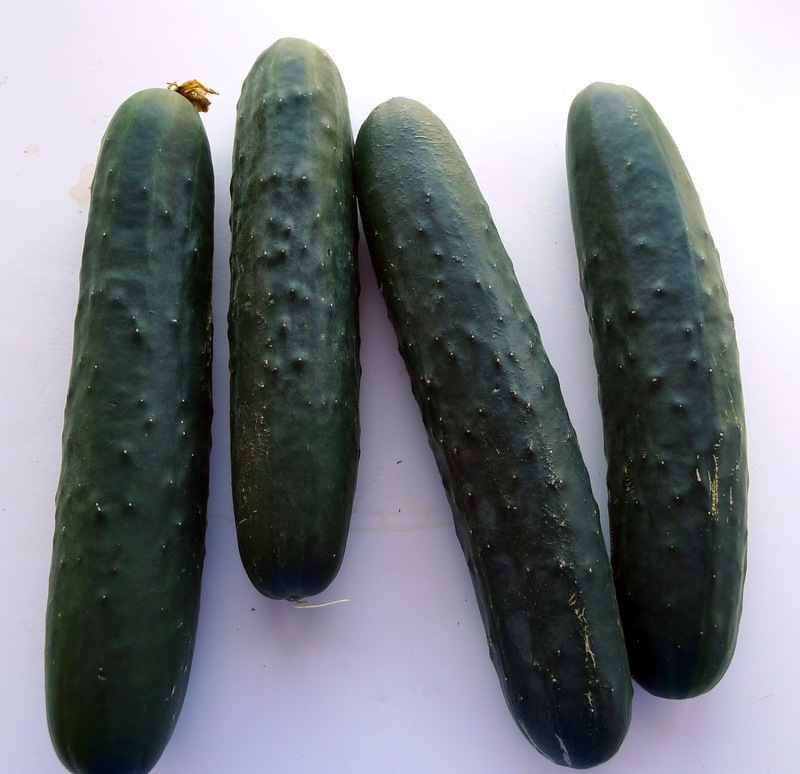 And, I’m sorting through pickle recipes, just in case the deluge of cucumbers threatens to inundate us. Cukes hiding in the foliage. 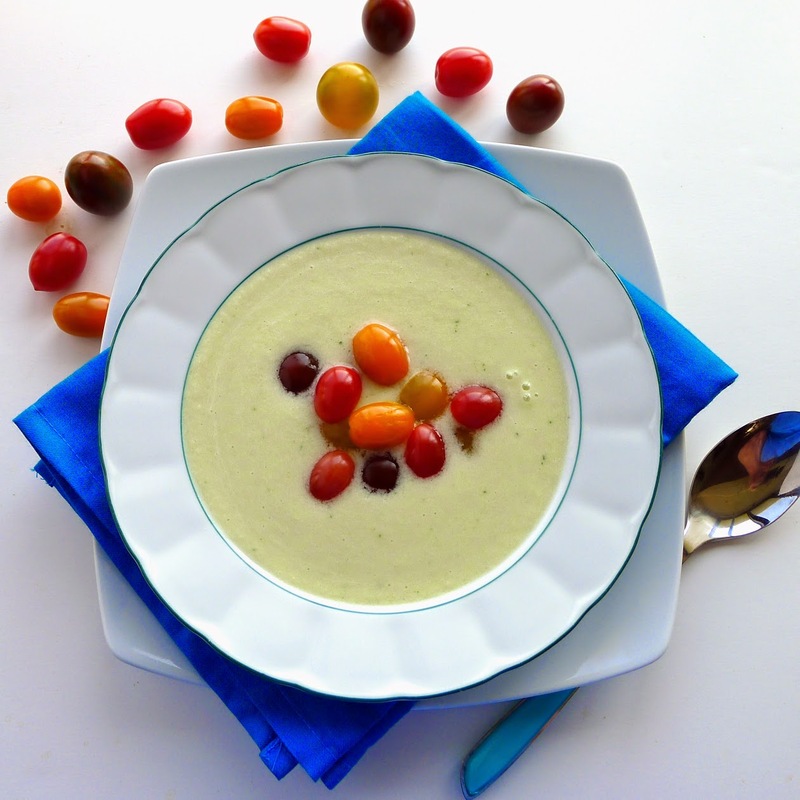 Cucumber gazpacho with cherry tomatoes. 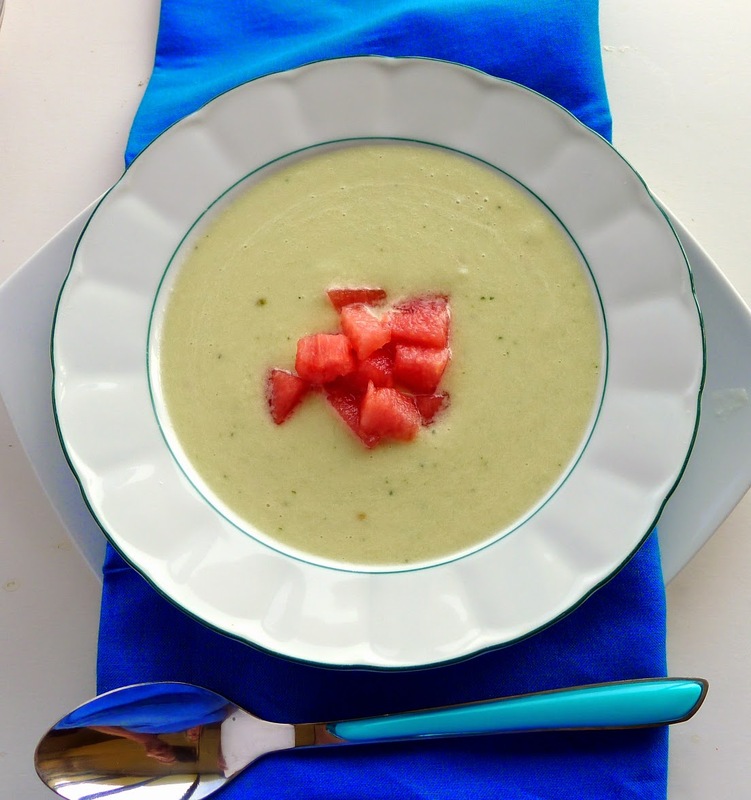 Cucumber gazpacho makes a great starter for a summer meal. Serve it in cups on the terrace while the steaks are on the grill. Swig it on a hot afternoon for a quick and cooling snack. Cool gazpacho served in short glasses. 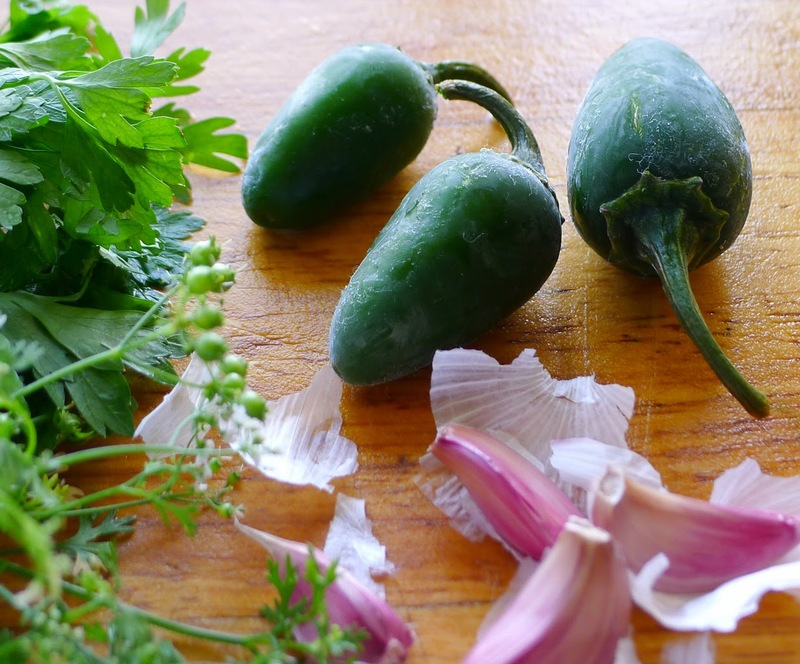 Switch the garnishes for cucumber gazpacho. Cherry tomatoes. Chopped watermelon. Chopped apple. Smoked salmon and sprigs of dill. Shrimp with snipped chives. 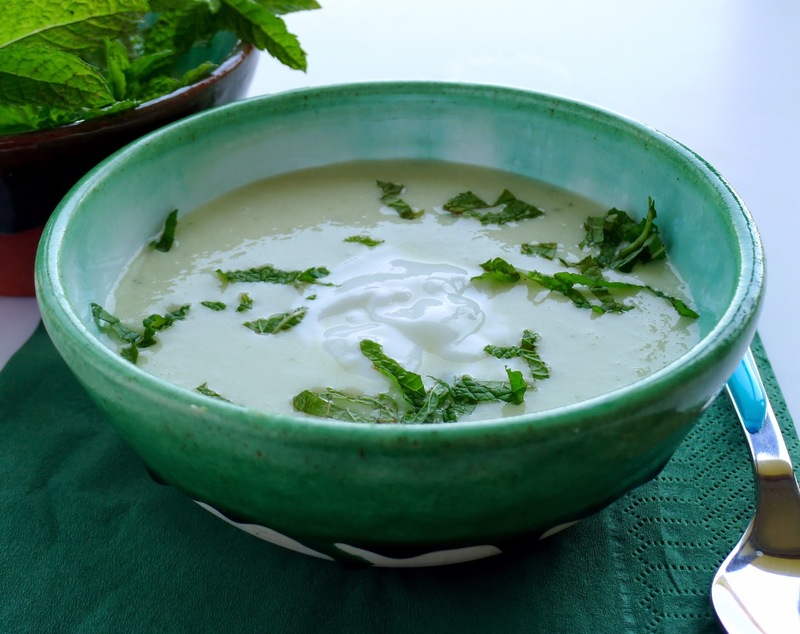 A dollop of yogurt and fresh mint. Cilantro and jalapeño. This version of gazpacho also has almonds. I happened to have some unsweetened almond milk, which I used to replace part of the water. Otherwise, grind a handful of blanched almonds with the cucumbers. Place the bread crumbs in a small bowl and pour over the almond milk. Allow to soak 30 minutes. Place the cucumbers in a blender bowl with the garlic and the soaked bread. Blend until smooth. Blend in the oil, salt and vinegar. Add water to thin the gazpacho. Chill the gazpacho. Serve garnished with chopped tomatoes or halved cherry tomatoes. 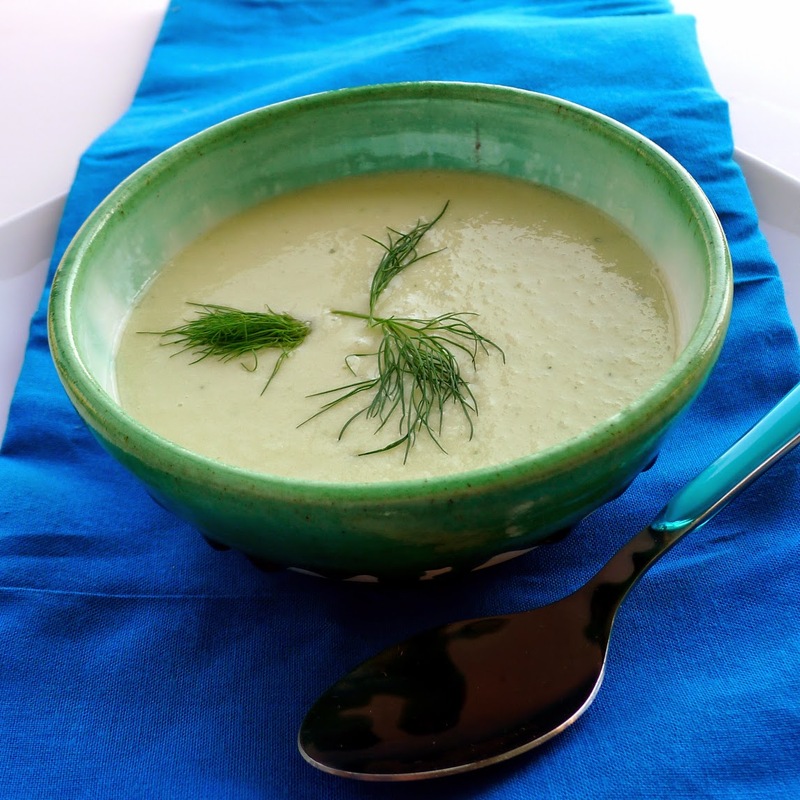 Cucumber gazpacho with yogurt and mint. So cool! More cucumbers on the way.